[AUTO](RC):When placed, COST [put a non-grade 1 card from your drop zone on the bottom of your deck], and this unit gets [Power]+5000 until end of turn. 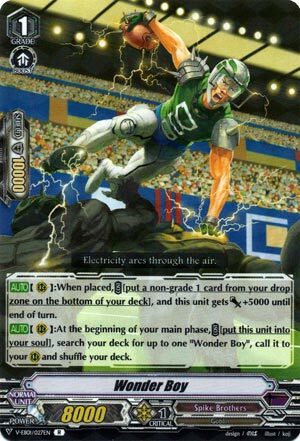 [AUTO](RC):At the beginning of your main phase, COST [put this unit into your soul], search your deck for up to one “Wonder Boy”, call it to your (RC) and shuffle your deck. You know what this calls for? A Nehalem to the face! Okay but seriously though, this new Spike Brothers seems to be playing a little different from old. No longer do they chain attacks Mid Battle, now it’s all about 3 massive columns for a price. This is a pretty obvious example, with its swapping calling not being Battle Phase related. But the fact it’s still a +0 wash and fuels soul is still pretty nice, and outside Kagero it’s not likely to be sniped being in the back-row. Works well enough but needs to be combined with something else. Luckily the deck has a lot of something elses.